You don’t need to go to an RV dealer for a limited selection at a high price when you need a new shut-em-off. Any faucet that fits the sink pattern (number of openings through the counter and the distance between them) will work in your RV. Yes, there are a variety of different connectors, but you’ll find an appropriate adapter if needed. Here’s the ticket: Remove the old faucet and take it down to the Big Box hardware store and shop for what you really want. Size it up for both counter-fit and water connections. Yikes, that generator is loud! Want to measure the actual dB (deciBel) SPL (Sound Pressure Level) of a generator? While there are many free and cheap apps for your smartphone, many of them need to be calibrated against a known-level noise source before they’re accurate. I’ve found some Android phones to be as much as 10 dB off. But you can get a factory calibrated meter, the same sort of thing we use when measuring concert levels, for about $30 from Galaxy Audio. Whatever type you use, just be sure it’s set to A-weight and Slow response, then step back 23 feet from the generator to be measured. Hey, would I lie to you? Learn more or order here. 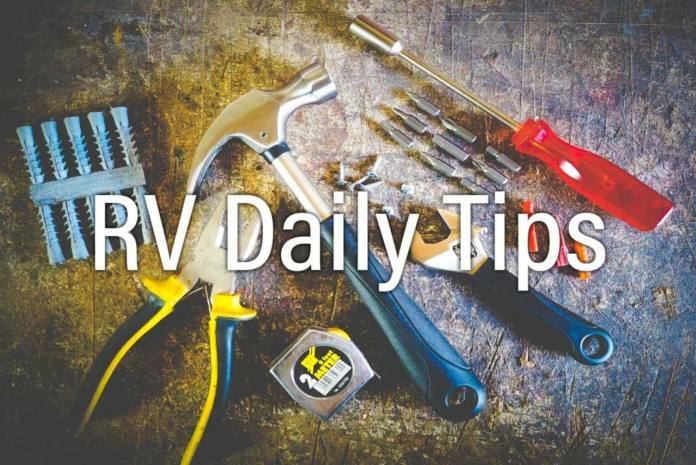 It can be hard keeping everything organized in a small space like an RV, right? Here’s Amazon’s list of best small-space organizers so you can keep everything in check. You’ll find everything from under-the-sink kitchen organizers, to clothing and closet organizers, to tiny little bookcases. Explore these helpful items here. Reader Thelma Thomas saw a tip about keeping plenty of water in your black water tank. 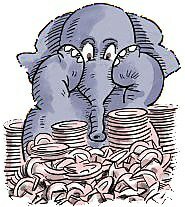 Thelma says, “A tip I saw and have shared often is to place a plastic dish pan in the kitchen sink for washing dishes. When done, dump the dishwater down the toilet. This not only adds water to the black tank, it helps decrease odors and also frees space in the gray tank for showers.” Thanks Thelma! The Number One suspect for a leak behind the toilet is your fresh water valve. These guys often leak if they were not properly winterized. The hardest part of the job? Probably getting the toilet pulled loose from the bathroom! Unless you’re a contortionist, space limitations usually require a remove-fix-reinstall operation. 20% off RoverPass, unlimited booking to over 6,000 campgrounds! RoverPass Unlimited is the all-access fast pass to booking campgrounds online. It allows you to search and book at over 6,000 campgrounds and RV parks without a platform fee. You’ll also get priority booking and one-on-one access with customer service representatives. Click here to receive 20 percent off an unlimited membership. 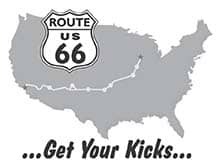 Route 66 has struck a chord with Americans and an international audience since its inception in 1926. However, the narrative of the road has primarily focused on men. The Women On The Mother Road project sheds light on diverse women’s experiences along the historic road. Chef Jen Segal has a great website with her favorite recipes. Our staff writer, Emily Woodbury, uses her recipes often. Her favorite is Jen’s New Orleans BBQ Shrimp (it’s so good). Editor and Publisher: Chuck Woodbury. Managing editor: Diane McGovern. Associate editor: Deanna Tolliver. Staff writer: Emily Woodbury. Contributing writers: Russ De Maris, Bob Difley, Gary Bunzer, Roger Marble, Mike Sokol, J.M. Montigel and Andrew Robinson. Advertising coordinator: Gail Meyring. The main reason we’re not attending the ‘local’ fireworks display here in Troy, Montana is – it doesn’t start until 11pm. That’s HOURS past this guy’s bedtime! We’re not used to it staying light this late at night. I suppose we may HEAR it five miles down the road. Ha.